This is my Guardian of the Garden sculpture which I've nicknamed her "Bird Woman". She is the largest piece of artwork I've ever done, being 6'4 tall, with 2' feet, a 4' arm span, a beak that is a good foot long, and big hands! She's all welded steel, which I started at Snow Farm back in May, worked on it in July, and finished it on 7/29. She is painted in shades of black, bronze, deep red and some gold, and has copper panels stitched into place around her waist to give her some definition. 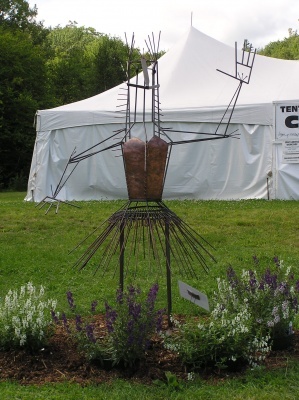 She is currently on display at the Sculpture Garden at the League of NH Craftsmen Fair, which is running Aug 1 to 9th in Newbury, NH. I hope she sells, for it's going to be a headache getting her home since I have to borrow a van for my little car is too small. It is nice to go really big and know I'm capable of working big. The Sunapee fair ( as the League of NH Craftsmen Fair is known as by locals), is going great, much to my surprise. The weather is great, people are coming in and buying and just enjoying the good weather. I'm a lot more tanned than I expected to be. I brought my hedgehog, Cal Jr. up so that my craftmen friends can meet him and he was a big hit at the fair today. People were coming to my booth to meet the hedgehog. Cal Jr was so outgoing, and so active it was like he was on speed, the way he was running around in the grass or when I'm holding him. 3 more days to go and then the fair will be over.